Finally! After months of begging their parents for ballet lessons, Ivy and Bean finally get what they want . . . well, not exactly. Much to their surprise, it turns out ballet lessons do not cover karate chops and roundhouse kicks. The girls have no interest in learning how to dance gracefully, but they promised their parents they would finish the entire ballet course! When it comes time for Ivy and Bean to participate in the ocean-themed class recital, the girls must figure out a way to get out of it without breaking their promises. 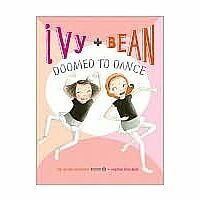 Ivy + Bean #7: What's the Big Idea?